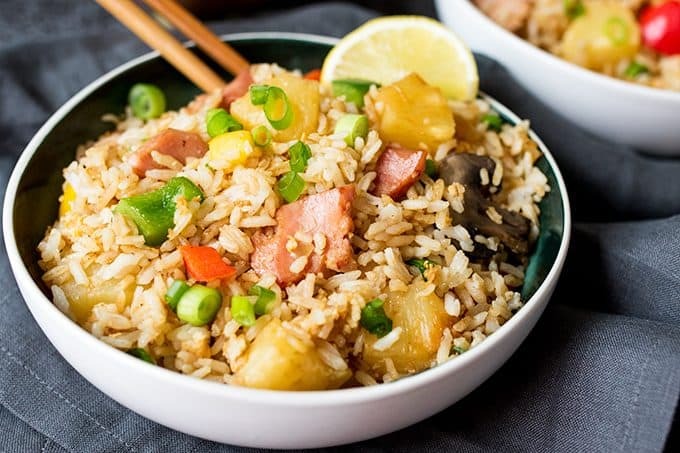 Does fried rice with pineapple sound weird? It’s my new thing and it’s delicious! Hiya, Nicky here from Kitchen Sanctuary with a Friday night dinner recipe that the whole family will love! 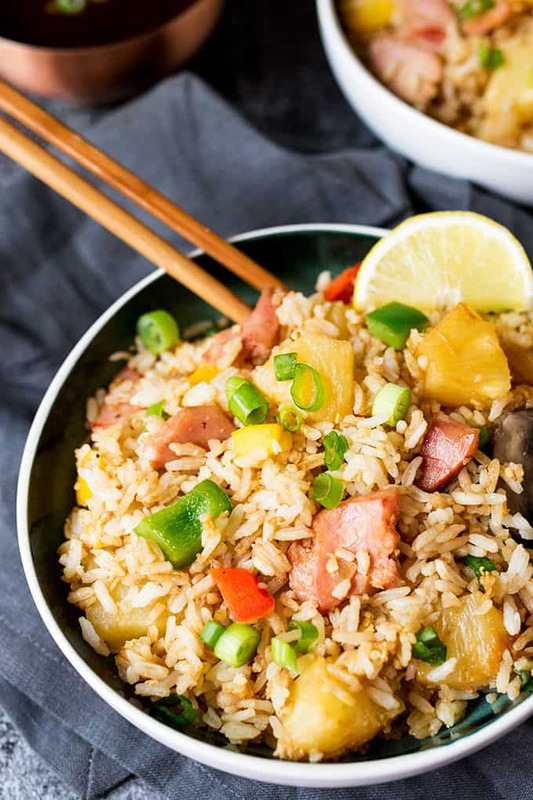 This Hawaiian fried rice has big chunks of ham and pineapple, plus a few extra veggies. I like bell peppers and mushrooms, but you can add whatever you like – peas, sweetcorn, tomatoes, I’d even be tempted to throw in some broccoli. The sweet and sour sauce is a super simple microwave version – although you can make it in a pan if you prefer. It’s made mostly made of ketchup, which is probably a little naughty, but it does taste authentic (and at least it’s not that scary bright orange color that you get from the takeaway!). I love to make a huge wok of this rice. I serve it up – usually leaving enough to save some for leftovers. But by the time the plates are washed, all of it has usually disappeared. Whoever’s doing the washing up generally can’t resist that leftover cooling pan of rice, and it’s gone before it ever makes it to the fridge! 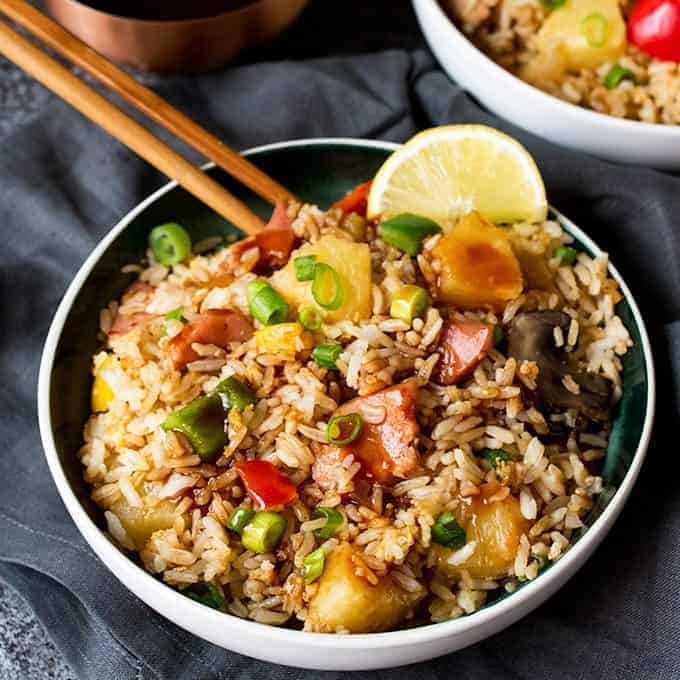 Do you like fried rice? 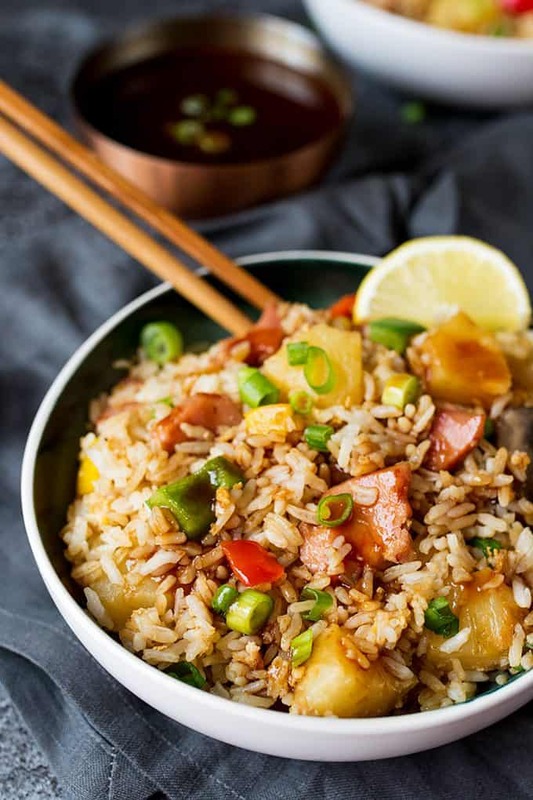 Fried rice with pineapple may sound strange, but after you try this recipe, you’ll see that it just works! 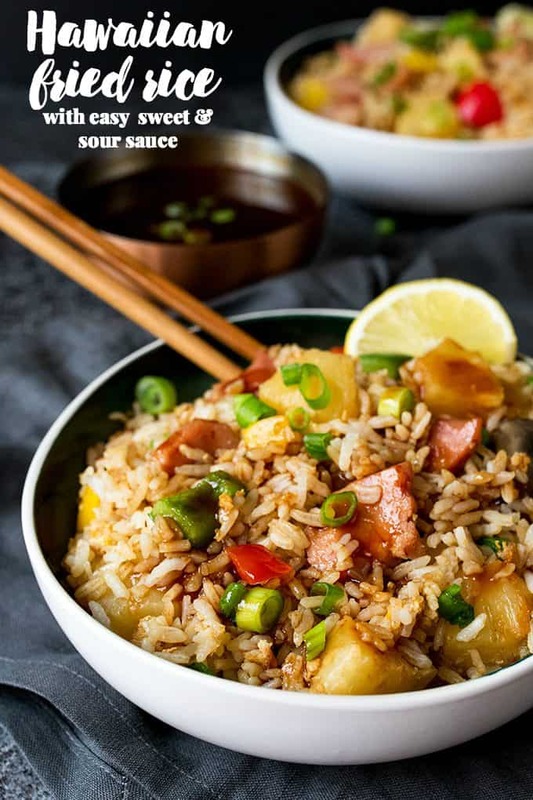 It’s made with big chunks of ham and pineapple, veggies and an addicting sweet and sour sauce. Start with the sauce. Mix the sweet and sour sauce ingredients together in a small bowl and place in the microwave. Cook for 1-2 minute until the sauce bubbles. Stir again then put to one side (you can bring to the boil in a small pan if you prefer). Heat the oil in a large wok. Add the onion and cook, stirring regularly on a medium heat for 5 minutes until the onion softens. Add in the red and green bell peppers, and the sliced mushrooms. Cook for a further 3 minutes. Add the ham chunks and pineapple pieces and cook for a further 2-3 minutes. Add in the cooked rice and turn up the heat to high, Toss everything together using a spatula. Add the soy sauce and garlic salt and continue to cook, moving everything around the pan regularly so it doesn’t stick, until the rice is hot (takes about 5-6 minutes). Once the rice is hot, push the rice over to the side of the pan and crack the eggs into the space. Move the pan so that the bit with the eggs in is right over the heat. Move the eggs round slowly until they start to scramble. As they scramble mix the eggs into the rice. Add the lemon juice, stir and taste. Add more soy sauce if needed. Divide between four bowls and top with chopped scallions and lemon wedges. Reheat the sauce for another 30 seconds, and serve it with the rice.